It’s December 23rd, and for those of us celebrating Christmas, we are heading down the home stretch. If you have finished all of your shopping, baking and wrapping, you are likely sitting back with your feet up, eggnog in hand. If you are like me, you have a list that seems to be getting longer instead of shorter, just like the line-ups in the stores. In fact, you probably have 2 lists – the things that you still need to do, and the things that you still need to buy. The to-do list might even include last-minute sewing!! Well, take comfort knowing that I’m sitting in my little corner of the world doing the same thing. It wouldn’t be Christmas if my sister didn’t get a “potential” gift – a partly-knit sweater or partly-sewn jacket. Some of the past gifts were not even partly done – a pile of fabric and a pattern. Where are Cinderella’s mice when I really need them? 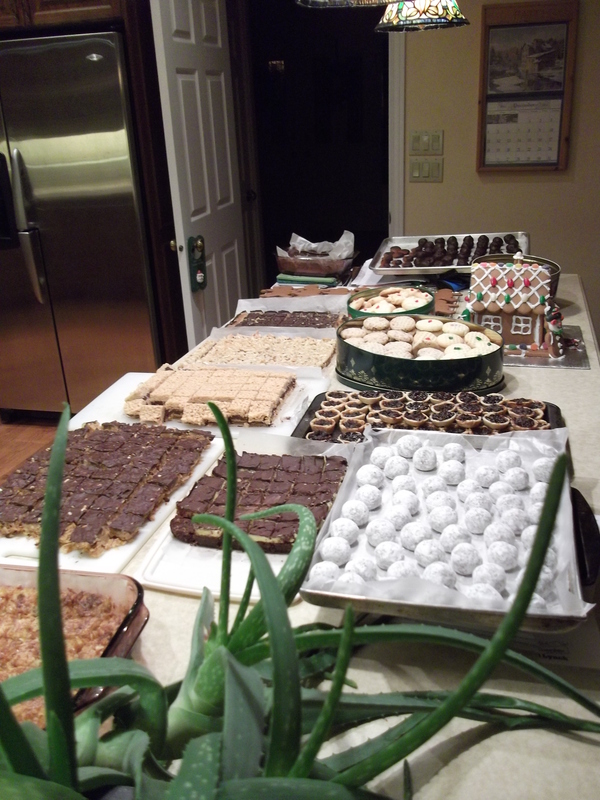 All of the baking is done, thanks to my 2 sons who helped me make 14 batches of cookies, squares, tarts etc. a couple of weekends ago. Many of them have been sent off as gifts, but we still have tins chock full, waiting to be consumed. Thanks to Barb for sharing her recipe for Apricot Horns. I will give them a try, when I remember to add cream cheese to my shopping list. I managed to get a lovely set of Christmas placemats and table runner made for my family’s new-to-us ski cabin. I still have 2 tablecloths to make. I am asking Santa for snow, because it’s looking like a green Christmas right now, and a green week after Christmas. My family is planning on spending the week skiing, but I may end up sewing and quilting instead if there is no snow. That’s not all bad either. I do have a bit of quilting to do before skiing starts – a lovely lap quilt for the Spring 2012 issue of Fabric Trends, on newsstands late March. 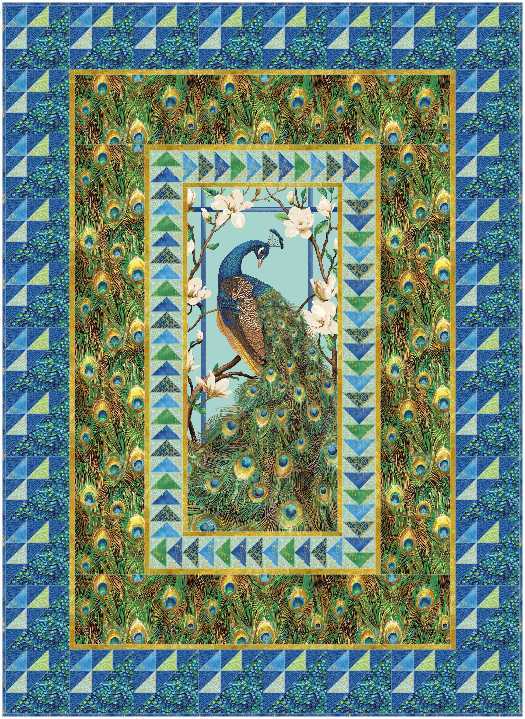 It showcases the stunning Peacock Paradise fabric collection. Because the fabric has metallic on it, I shall use Superior Threads’ Metallic gold thread for the quilting. It is so easy to quilt with! I shall try to get it done tomorrow while my Christmas puddings are baking. The best of the season to each and every one of you! May you find time to spend with those dear to you this holiday season. We will chat again in the New Year.